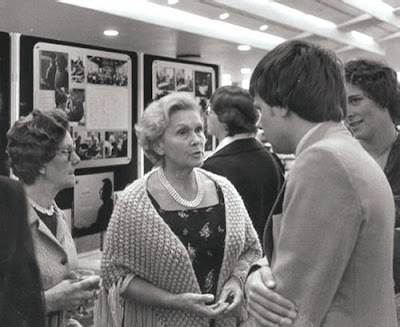 The photo above is of me talking to Elisabeth Schwarzkopf at the Royal Festival Hall, London in 1979 (you can date it from my hairstyle). 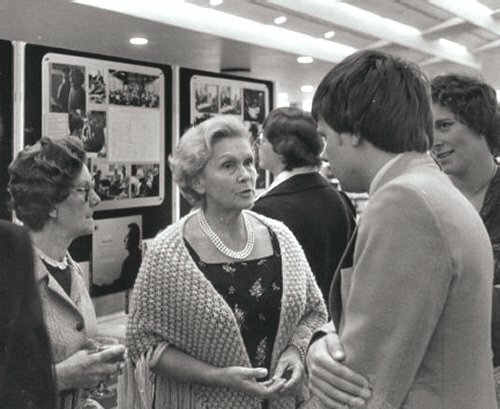 Schwarzkopf’s husband, and recording legend, Walter Legge had died the previous month (the lady to the left is Miss Jane Withers, Legge's long-serving secretary). The Philharmonia Orchestra, which Legge created as a vehicle for his recording activities, had asked me to create a tribute exhibition at short notice. Some of the material was taken from my own personal collection. Elisabeth Schwarzkopf was delighted with the tribute, but was far less impressed with my description of Legge as an ‘entrepreneur’. When the photo was taken I think I was trying to explain to her that ‘entrepreneur’ was a complimentary description. But I am afraid she was not persuaded (or was I distracted by those pearls?). Elisabeth Schwarzkopf, the greatest soprano of the post-war period, died yesterday aged 90. A re-evaluation of her career here. Are you sure that's not George Harrison in the photo? Berend, fair point, and my first choice for the Four Last Songs would probably be the Janowitz version with Karajan and the BPO. I really should have written 'arguably the greatest soprano of the post-war period', but in the circumstances I decided to give Madame Schwarzkopf maximum respect in that one post. Jerry, by one of those weird pieces of synchronicity the snail post yesterday brought a copy of Joshua M Green’s book Here Comes the Sun – the Spiritual and Musical Journey of George Harrison that I had ordered recently from an internet retailer. Berend, but there are truly many recordings of Schwarzkopf that I couldn't live without. Obviously there is Der Rosenkavalier, but I would also nominate her Cappriccio with Eberhard Wacher, Nicolai Gedda, Dietrich Fischer-Dieskau, Hans Hotter, Christa Ludwig and Anna Moffo with Wolfgang Sawallisch conducting Legge's Philharmonia Orchestra. The final scene plays on my old World Records (SOC 230/1/2) vinyl LP set as I write.